Presbyopia is the result of your body’s natural ageing process that gradually degrades our ability to focus up close. Both men and women will eventually develop presbyopia, typically beginning around the age of 40 and continuing until age 65. .
For the first few decades of your life, the crystalline lens inside the eye is soft and flexes easily. This ability to flex allows you to focus accurately and quickly on the world around you, near or far. The body’s ageing process diminishes your eyes ability to focus as the lens naturally begins to harden and you can expect increased difficulty in reading computer screens and books. .
You will experience a gradual onset of symptoms as you age. They typically present around 40 years old. Presbyopia is one of easier eye conditions to treat. It certainly doesn’t need be a life sentence of blurry vision. Eyeglasses and Contact Lenses – The simplest form of treatment. Since presbyopia advances with age, your prescription will need to be increased over time. Corrective Eye Surgery – A great option for viable candidates. There will not be a need for eyeglasses or contact lenses post-surgery for an appreciable length of time. As always, results will vary for each patient as it is dependant on their individual ageing process. Corrective surgery will not be a permanent solution to your presbyopia, but it will remove the need to carry around glasses and wear contacts for many years. Diabetic eye disease refers to a group of eye conditions that affect people with diabetes: diabetic retinopathy, glaucoma, and cataracts. Diabetes is the leading cause of blindness in Canadians under the age of 65. Diabetic eye disease is primarily the result of chronically high blood sugar levels. It is important to note that even if you have diabetes, it does not mean you are guaranteed to develop one of these diseases. As well, people without diabetes can develop any type of the 3 following eye conditions. This particular type of retinopathy is the most common eye disease that diabetics are at risk for. Diabetic retinopathy directly affects the blood vessels of your retina (the light-sensitive tissue that lines the back of your eye). When diabetes isn’t managed properly, chronically high blood sugar levels will eventually cause damage to the small blood vessels of the retina. These damaged blood vessels have the potential to leak fluid or blood into your eye. This leakage will in turn cause the retinal tissue to swell, leading to distorted vision. If left untreated, patients with diabetic retinopathy can expect to suffer from complete vision loss. Mild Nonproliferative Retinopathy – In the initial stages, microaneurysms occur in the tiny blood vessels of the retina. They begin to swell, forming pockets of fluid and blood. These microaneurysms may leak fluid into the retina. Moderate Nonproliferative Retinopathy – The blood vessels that directly sustain the retina may swell and become disfigured. This may lead to the vessels losing their ability to transport blood to the retina. Severe Nonproliferative Retinopathy – As nonproliferative diabetic retinopathy progresses into its final and severe stage, you will experience vision loss. Proliferative Retinopathy (PDR) – This advanced stage sees severe changes to one’s vision. As fragile, blood vessels begin to form and grow inside the surface of the retina, leakages begin to occur. As blood and other fluids leak into the vitreous (interior substance of your eye), vision begins to cloud. Retinal scarring can be a direct result of the newly formed weak blood vessels. If this happens, there is a risk of the retina being pulled on and eventually detaching, ultimately leading to a complete loss of vision. People with PDR also have a strong risk of developing neovascular glaucoma, a potentially permanently blinding disease. If retinal tears/detachment is detected and treated early on, vision loss can likely be prevented. We recommend regular eye exams, once per year, if you have diabetes. As blood and other fluids leak into the vitreous (interior substance of your eye), vision begins to cloud. Retinal scarring can be a direct result of the newly formed weak blood vessels. If this happens, there is a risk of the retina being pulled on and eventually detaching, ultimately leading to a complete loss of vision. Diabetic retinopathy progresses slowly and quietly, often going undetected until your vision is already damaged. A cataract is the clouding of the natural lens in your eye. If you have diabetes you are at risk of developing cataracts much earlier in life, with a faster rate of progression. If you are an adult with diabetes, you have double the risk of developing glaucoma. Glaucoma is a group of eye diseases that can cause complete vision loss as a result of damage to the optic nerve. If you have diabetes, or a health condition with an increased risk for eye disease, we recommend having a comprehensive eye exam every year. The earlier our Optometrist is able to detect potential eye conditions, the more likely they are able to prevent you from experiencing complete vision loss. Yearly eye exams will provide us the opportunity to monitor your overall eye health and catch the smallest of changes, before there is severe damage to your vision. What Are Eye Floaters and Flashes? The interior of our eye is mostly filled with a gel-like substance known as the vitreous. Our body’s natural ageing process will gradually begin to shrink our eye’s vitreous. As this happens, the vitreous detaches from our retina and creates a watery center. Small clumps of matter will form during the deterioration of the vitreous, creating what we refer to as eye floaters. Eye floaters appear is small specks or squiggles, and when you try to look at them directly they seem to dart off to the side. When the vitreous pulls or rubs on your retina, you can experience flashes of light. Typically, eye flashes occur naturally as we age. The vitreous will eventually separate from the retina, typically by the age of 60 years old. It is common for this to occur without noticing anything or experiencing any issues. When Should I Be Concerned About Eye Floaters and Flashes? Eye flashes and floaters are often harmless and should go away on their own after brief appearances. We recommend prompt assessment by our Optometrists if you find that your eye floaters or flashes have suddenly increased in size or amount, obscure your vision, cause decreased vision or just simply do not fade away like usual. They may be indicating a retinal tear or complete retinal detachment. Both are very serious conditions that can lead to irreversible vision loss if not detected and treated expeditiously. Can Eye Flashes and Floaters Be Treated? If the cause of your eye flashes or floaters is a retinal tear or detachment, the prescribed treatment will be immediate vision surgery to prevent total blindness. Conjunctivitis occurs as a result of the conjunctiva – the thin, clear tissue that covers the white part of our eyes and lines inside the eyelid – becoming inflamed. Who Can Get Pink Eye? Anyone can contract pink eye. There is an increased likelihood of exposure to the contagious versions for those who work in close proximity with others. If you are experiencing any of the above symptoms, please let us know when you book a consult with one of our Optometrists. What Causes Pink Eye and How is it Treated? The course of treatment appropriate for your conjunctivitis will depend on the type you have. A proper diagnosis by one of our Optometrists is necessary to confirm the form of treatment right for your condition. Pink eye caused by bacteria is treated with an antibiotic regimen, which may include a combination of: eye drops, medicated ointments, oral medication. This form of conjunctivitis is contagious and can be contracted through direct contact with infected hands or items that have touched the eye. Antibiotics cannot treat viral conjunctivitis, just like the common cold, it must run its due course. However, with early diagnosis the length of the course can be reduced with certain eye drops. This form of conjunctivitis is extremely contagious. If you are diagnosed with viral conjunctivitis it is recommended that you avoid public places and contact with others, in addition to maintaining strict personal hygiene. Allergy sufferers often experience pink eye/red eye as one of their symptoms. Allergy medications (oral pills) from over the counter and over the counter eye drops are typically not sufficient for treating allergy-caused conjunctivitis. If you are suffering from severe allerigic eyes, our Optometrist can prescribe very effective eye drops for your condition. Mild irritants like shampoo/conditioner, dirt, smoke, or chlorine from pools, can cause pink eye/red eye. If you experience irritation from relatively innocuous substances like these, a thorough rinse of your eyes (with water) for several minutes should be sufficient treatment. For situations where your conjunctivitis is the result of an acid or alkaline substance, like cleaning chemicals, you will require immediate medical attention to avoid potential vision loss. Cataracts are the result of our body’s natural ageing process. They can present in one or both eyes, clouding our vision and diminishing our ability to see. Around 40 years old (and onwards) the lens in our eye gradually increases in thickness and decreases in transparency and flexibility. A by-product of this gradual breakdown in the tissues within the lens is the clouding of our lens. As one of the most common causes for vision loss in Canadian men and women over the age of 40, anyone can develop cataracts. If you experience any of the above symptoms, our Optometrists recommend booking in for an eye exam as soon as possible. Eyeglasses and Contact Lenses can often effectively and non invasive improve vision in people with cataracts in the early development stages. Early detection is paramount for diagnosing cataracts.If your cataracts have progressed beyond the point of correction through prescription eyewear, surgery may be an option for you. For the right candidate, cataract surgery offers a high success rate for vision correction. If you are worried that you are developing cataracts or would like to know if you are a viable surgery candidate, please book an appointment. AMD is a disease of the eye that leads to the gradual loss of sight as you age. It occurs as a result of the small central portion of the retina, known as the macula, beginning to deteriorate. The macula is responsible for detailed central vision, providing us the ability to read, drive safely, or recognize the faces of our loved ones. 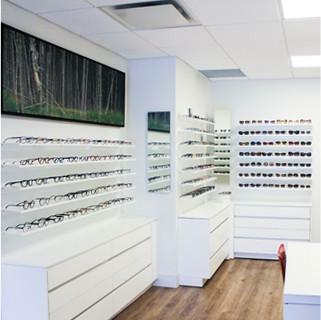 It is the leading cause of vision loss among Canadians, both male and female aged 60 years and older. AMD is divided into 2 different types, of which you can potentially have one or both types. The majority of AMD cases are atrophic (90%) and the remaining 10% are exudative. This form of AMD is characterized by drusen, yellow deposits in the macula. As the drusen develop in size and quantity, your vision will increasingly become distorted and noticeably dim. If dry AMD reaches the advanced stage, the light-sensitive layers of your eye begin to thin and eventually die. This will lead to the complete loss of central vision. Exudative AMD is characterized by the development of abnormal or weakened blood vessels underneath the macula. When blood and other fluids leak from these irregular blood vessels, your vision will become distorted and you will likely have blind spots. During the advanced stages, the abnormal vessels form scar tissue, resulting in severe loss of central vision. The symptoms of AMD vary as they depend on the stage that the macular degeneration has reached. AMD symptoms do not appear during the early stages of the disease, usually progressing unnoticed. Regular eye exams are the only way we can detect your AMD in the early stages. Near to complete central vision loss is the only symptom of advanced stage AMD. AMD progression can be slowed down with the use of caretinoids and antioxidants found in the macula. These include Lutein, zeazanthin and meso-zeazanthin. Be sure to ask our optometrist what formula is recommended. Why Do Allergies Affect Our Eyes? Allergic conjunctivitis develops when your body’s immune system overreacts to something in the environment that is usually considered completely harmless. When these allergens come into contact with the antibodies in your system, the mast cells in your eyes spring into action. Mast cells are loaded with histamine and respond by releasing their chemicals in an attempt to fight these “allergen invaders”. This reaction manifests as typical allergy symptoms (outlined below). Determining the best course of action when it comes to properly treating and managing your allergies will depend on the cause of them in the first place. We understand it isn’t realistic to live your life cooped up inside or in a large bubble, so we have comprised a list of options to help you manage your eye allergy symptoms. A large step to reducing your exposure to allergen begins in your home. We recommend doing your absolute best to reduce the dust throughout your house. This can be done by investing in high quality air filters for your furnace/air conditioner, wet cloth dusting a few times a week, and washing your bedding often. Keep your windows closed during peak allergy season, and try to limit your time outside when you can. Protect your eyes where you can by reducing the amount of pollen and other environmental allergens getting into your eyes. This can be done simply by wearing your eyeglasses or sunglasses when you are outside. Rubbing your eyes will only serve to aggravate your symptoms. Prevent that release of histamine from the mast cells in your eyes with antihistamines. You can purchase them over the counter in the following forms: oral medication, patches, and lubricating eye drops. Eye drops or oral medication may be prescribed by our Optometrist if you find over the counter medications are not providing effective relief. Glaucoma is complicated, progressive eye disease, often referred to as the “silent thief of sight”. It is characterized by its lack of symptoms until vision damage has already occurred. The fluid inside our eyes, known as aqueous humor, flows out of the eye via a mesh-like channel. Glaucoma is the result of this channel becoming blocked or the fluid building up quicker than it drains.. The fluids builds up in the eye, increasing the pressure inside. The optic nerve is not meant to handle pressure of this magnitude and ends up damaged, leading to vision loss. If you are experiencing high pressure in your eyes, don’t worry. It is not always a sign of glaucoma, though you should schedule an eye exam as you may be at risk. Like many things in life, it is better to be safe than sorry. There are several options available for treating glaucoma. The type and stage of your glaucoma will determine the treatment prescribed by our Optometrist. Trabeculoplasty (Laser Surgery) – A laser is used to subtly change the way your eye drains fluid. This allows the eye’s drainage system to function properly, reducing IOP (intraocular pressure). Trabeculectomy (Conventional Eye Surgery) – A new opening is created in the eye to allow excess fluid to drain. IOP is lowered and pressure is taken off of the optic nerve. If you are concerned about your risk for developing glaucoma, book an eye exam with our Optometrist. We would be happy to provide a comprehensive exam, answer all of our questions, and, if applicable, walk you through which course of treatment is right for you.